But for 7-year-old Shiroh, it’s more than that. She knows there must be something wrong because she feels tired all the time now. It’s something that has been getting progressively worse and today is the worst it has ever been. She sits inside The Freshfire Children’s Home in a chair trying to catch her breath and fear sets in and tears fill her young eyes. She takes in deep breaths and watches as afternoon shadows grow long on the wall in front of her, then looks down at her hands. Why are her fingers blue? More than three thousand miles away in Errabalem, South India, Yesudas Rajulapati’s phone rings. It is the school calling. The Director of Errabalem Boy’s Home takes the phone call and his wife watches as his eyes grow big and his face grows pale. He hangs up the phone and tells his wife they must go to the school immediately. They arrive at the school where an ambulance sits idling in the parking lot. The lights are flashing and the rear doors are open. As they exit the car and step out into the afternoon heat, EMT’s emerge from the front doors pushing a stretcher. Lying pale, still and unconscious on the stretcher is 13-year-old Vikram Kumba who lives at Errabalem Boy’s Home. Vikram has been unconscious for some time after collapsing and going into convulsions. He will remain unconscious for hours to come and no one knows why. Thousands of miles from both Uganda and India we receive two emails from the distraught and panicked Directors telling us of the frightening news about these two children. Like the Directors we are immediately flooded with compassion and worry for these two young children who have already suffered so much in their young lives. Following a very brief discussion we email both of them back and tell them to proceed with any necessary medical care and to keep us informed of diagnosis, condition and costs. The clock ticks on and the days pass. Then we receive the emails we have been waiting for. We are about to learn what is wrong with the children. It’s something we need to know, but based off the limited information we already have, we don’t expect good news and we read the emails with apprehension. Our concerns are justified and confirmed as we read the reports from Jinja and Errabalem. Irene, the Director of Freshfire in Jinga, Uganda informs us that Shiroh has been diagnosed with Pulmonary Valvular Stenosis. It’s a condition in which her heart valve has become too thick and heavy and it restricts blood flow to arteries. Her oxygen saturation is only 63%. Far below safe levels. It’s no wonder this sweet, little girl is so tired all the time. It’s no wonder now why her fingers, lips and eyelids are tinted blue. The news regarding Vikram is no better. His diagnosis is a tumor on his brain. It is unknown at this point just what kind of tumor it is. It will require more tests, an MRI and specialists to diagnose the rate of growth, danger and whether or not it is cancerous. All potential treatments will be subject to those findings. It is heartbreaking that these children have to suffer beyond the tragedies that life has already thrown them. Shiroh lost her father to AIDS and her mother is infected and slowly dying from the same disease. She has several siblings and her mother was unable to care for them all which is what led to her coming to Freshfire. At a very young age she has suffered from neglect, hunger, deep sadness and now serious problems with her heart that put her very life at risk. Vikram has suffered as well. His father is a drunk who abandoned his family. His mother is a field laborer who could not care for her children and had them put in a government hostel. Vikram was so unhappy in the hostel that he stopped going to school and eventually ran away, back to his mother’s where there was no food and no daily care. 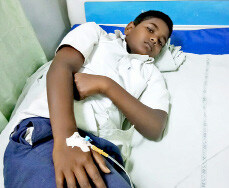 This is how he ended up at Errabalem Boy’s Home and now he faces serious medical problems with this tumor on his brain. Yes, it is heartbreaking that these children must face these medical challenges. And I know that we will be doing all that we can to help them recover to full health. We will pray. We will work with the directors to be sure that they are getting the best medical care possible. They deserve that. But that is not the heart of the matter. When we learned of the medical problems that Shiroh and Vikram were having, we immediately authorized all necessary expenses related to caring for them. That decision was made without hesitation. When you consider that we are a mission in which every dollar spent must be replaced with another dollar and that dollar can only come in the form of gifts, why is it that we are able to make such decisions without hesitation? When we learned what had happened, we immediately planned to put the stories of the two children in our monthly newsletter. I planned to write a cover story much different than the one you are reading. It would have told their story as I have, but it would have been a plea for help as well. This instead is the story of how while we were putting the newsletter together, an email was sent out to you, our faithful partners telling you of this emergency. This is the story of how in one day, one single day, you answered back and covered all of the costs we currently know about related to the children’s medical conditions. This is the story of how your faithful record of compassion gave us the confidence to have Irene schedule a life-saving surgery for Shiloh. She will fly to India in June and undergo a procedure to repair the valve on her heart. This is the story of how that same record of compassion in action gave us the confidence to tell Das to take all necessary steps to discover what needs to be done to treat Vikram. Your response to our email changed my story. Your response to our email changed the story of these two innocent children’s lives. For that, we are forever grateful. More than two thousand years ago, one person, fully man and fully God, walked our earth and showed the same kind of compassion that you have. He healed the blind and fed the hungry and gave all the Glory to His Father, asking for nothing in return. He exhibited the perfect love that comes only from the heart of God. Every day, each and every one of you exhibit that kind of love with your gifts to help the thousands of children we care for in this mission. Those actions are truly something special. Truly something good… and all good comes from God and glorifies Him. And that… is the heart of the matter.